A number of non-amateur radio operator readers have asked me the meaning of some of the technical words which appear in my blog. I will develop a guide to ‘jargon’ over the next little while to assist such readers. All amateur radio operators have a unique station call-sign. In Australia those call-signs are allocated by the Federal Government agency called the Australian Communications and Media Authority. Most readers will be familiar with the call-signs or station identification of their favourite broadcasters. Amateur call-signs are made up of three parts. The first part is the country identification. For Australian amateurs this is VK. For aviation it is VH and utilities VL. Occasionally Australian amateurs are allowed to use AX or VI, usually for Australia Day and special event stations. The second part is the Australian call area. These are VK1, Australian Capital Territory, VK2, New South Wales, 3, Victoria, 4 Queensland, 5, South Australia, 6, West Australia, 7, Tasmania, 8, Northern Territory and 9, Australian external territories, such as Norfolk Island, Christmas Island and so on. The third part of a call sign is the unique suffix, two, three or four letters. There are three grades of amateur licences and I will say more about this later. There are three levels of amateur licence in Australia. The first is the Foundation licence. This licence grade has a four letter suffix starting with F. This year, 2015, marks the tenth anniversary of this new licence. It is the entry level grade into the hobby. The next level is the Standard licence and the highest level is the Advanced licence. The Wireless Institute of Australia has a page which describes the different levels. Amateur stations give the time in Universal Coordinated Time (previously known as Greenwich Mean Time). This is based on a 24 hour clock and is calculated from the Greenwich Meridian. Greenwich Mean Time is often abbreviated Z or UTC. For example, the time is 10:00z. You can set your clock to UTC by adding the number of hours west of Greenwich Mean Time or check with a time and frequency station such as WWV or WWVH easily heard on 15 Mhz (and sometimes on 10 Mhz) on a short wave receiver. The female voice is the Hawaiian station and the male voice is from Boulder, Colorado. You will hear amateurs using the expression CQ CQ CQ. This is used when you wish to call any station which might be listening on the frequency that you are using to transmit. It is commonly called the general call to all stations. The Q codes provide a short hand way of asking a question or conveying information. Common Q code expressions are: QRZ (who is calling me? ); QRT (I am shutting down my station); QRX (please stand by) and QTH (home or place from where I am transmitting or in a question: where is your QTH?). QRP means operating with five (5) watts or less. QSO means a contact. A contact to be legitimate and count for an award requires accurate copying of call-signs and a signal report by each station (without assistance from other stations who may be listening on the frequency). There are many more Q code words. A QSL card is a written confirmation that a legitimate contact has occurred between two stations. The minimum information exchange is accurate recording of the other station’s call-sign and a signal report. 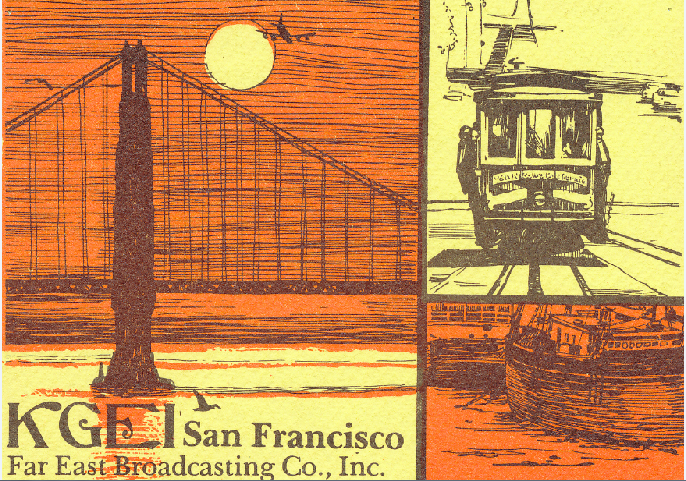 KGEI, in San Francisco, now longer operating, was a privately owned religious broadcaster. 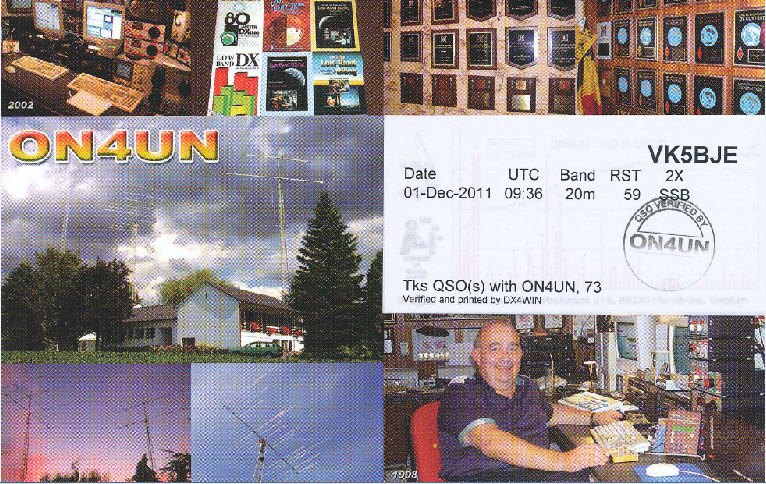 To receive a QSL card I had to send a signal report and a comment or description of the program content. I used to like listening to Short Wave broadcasters, particularly when I was young and even more so if I had build the receiver. John Devoldere, ON4UN, is the author of the 1987 book, Low-Band DXing: Your Guide to Ham Radio DXcitement on 160, 80 & 40 Meters, First Edition, American Radio Relay League, Newington, CT. I have the first edition. There are a number of subsequent editions. It was a great thrill to have a contact with the very significant figure in amateur radio. 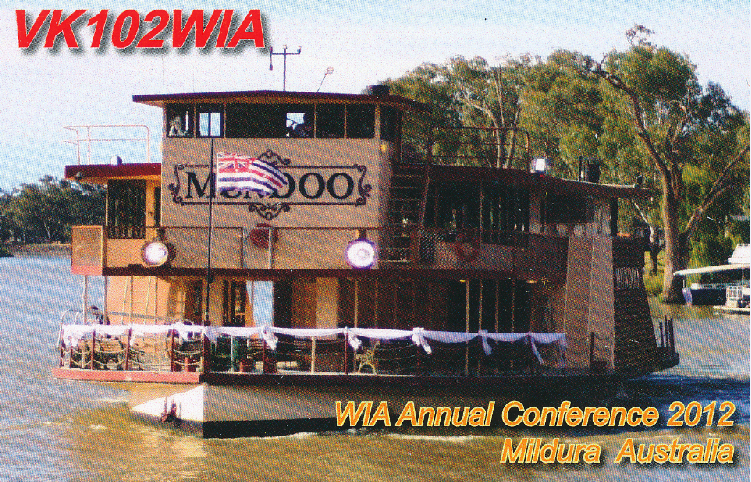 The card from the Wireless Institute of Australia, the oldest national amateur radio society in the world, commemorates the Annual General Meeting held in Mildura. My contact was made using a hand held radio on the two (2) metre amateur band. I have hundreds of QSL cards in my collection and each one tells a story and bring back lots in interesting memories. QSL cards are similar in shape to Post Cards. 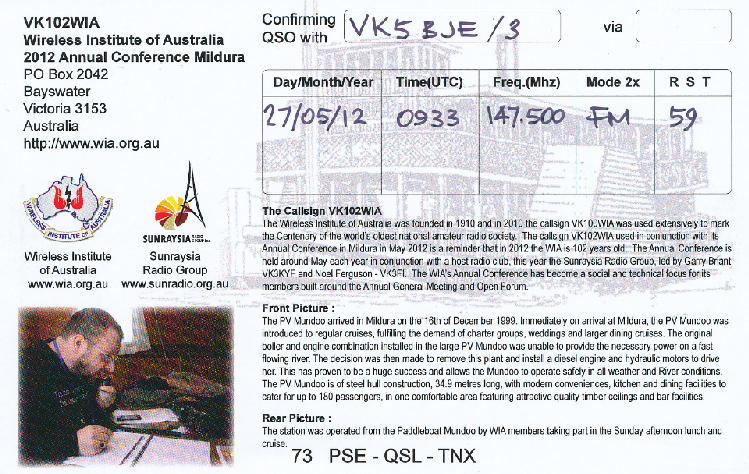 However, the traditional QSL card is now augmented by electronic forms of confirmation of contacts. 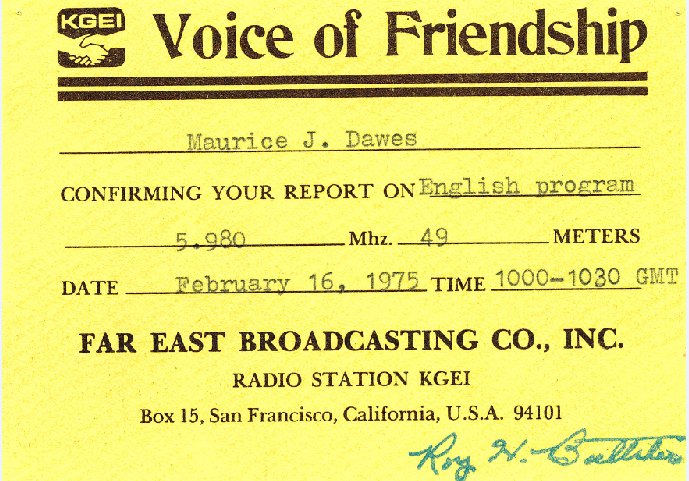 Perhaps the best two known systems are EQSL and the American Radio Relay League’s Log Book of the World. Pictured below is a typical page from my log on Logbook of the World. Click to expand the picture. SOTA is an activity which supports portable operations by amateur radio operators. It also offers awards to amateurs who reach specified goals. However, the originators of the SOTA stress the importance of setting personal goals as well, for example, improving operator skills, being realistic about climbing, staying safe and observing fire safety regulations to name just a few. All Australian states and territories have their own SOTA associations. While summits do not have to be climbed the rules state that the activation zone must be approached on foot. Car-based activations are not permitted and neither are generators. The challenging summits are those that require a considerable hike while carrying radio gear in a back-pack. While South Australia has lots of summits, most are in the north of the state, requiring long-distance driving for access. Tasmania, Victoria, the Australian Capital Territory and New South Wales are endowed with many summits and hence most of the SOTA activations take place in those jurisdictions. Summits are approved by SOTA after meeting certain requirements of height and prominence, and are then given a unique identifying code. For example, Australia’s highest mountain is Mount Kosciuszko in NSW has the code VK2/SM-001. Being an activator is just half the fun. The other side of SOTA is to be a chaser, that is, a home (or mobile) station who is engaged in trying to have contacts with as many SOTA activators as possible. There are more chasers than activators. The Keith Roget Memorial National Parks Award is aimed at encouraging portable operations in Victoria’s National Parks. The award is named after the late Keith Roget (silent key or SK in amateur radio language) who was a keen portable operator in his home state. This is a popular award and attracts many operators. The South Australian National Parks and Conservation Parks Award has similar objectives to the Victorian Keith Roget Memorial National Parks Award. The SA award requires portable operations to be battery operated and not vehicle based. This means operators usually use five (5) watts of Radio Frequency energy to the antenna, or in ham speak a QRP operation. It is possible to use more RF power but the DC input power to the radio has to be battery based (this means heavy lead-acid batteries of the type found in vehicles) or more modern Lithium chemistry batteries. In other words you don’t get something for nothing. More power out means more power in and transceivers are at their worst about 65% efficient. Antennas are usually light-weight wire supported by a fishing pole (squid) pole. The Australian (VKFF) program can be regarded as a sub-program of the World Wide Flora and Fauna program (WWFF). A simple explanation of this program is that it encourages portable operations from Australian National Parks which are registered with the WWFF program. Australian Parks which are registered have a VKFF number. Kosciuszko National Park in New South Wales has the VKFF number of 269 shown as VKFF-269. 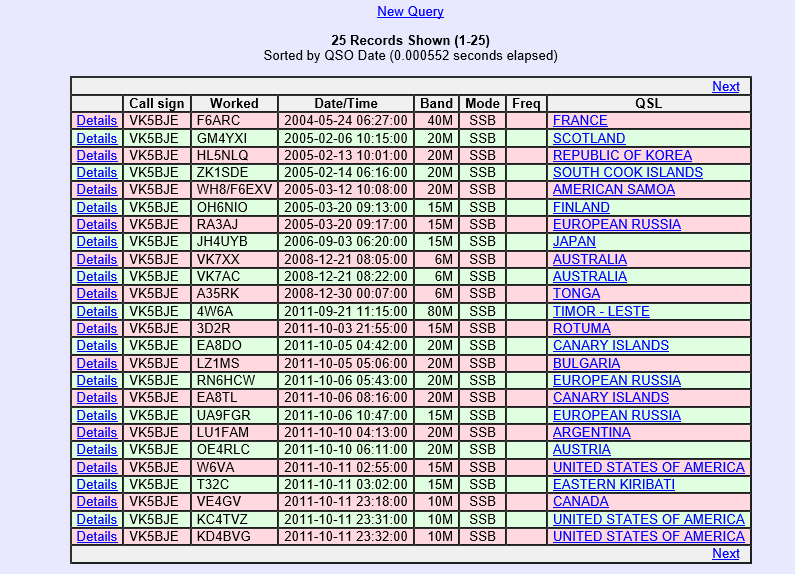 Ten contacts, or QSO’s are required to qualify a VKFF activation. Here is a link for more information. The World Wide Flora and Fauna Award program is similar to the Australian sub-program but the qualifying step is 44 contacts from each park. This is not always easy to achieve in Australia and many operators will take two or more activations to gain 44 contacts. This step by step process is allowed under the rules. Here is a link for more information. The art and science of listening to or having a two-way contact with distant stations. In amateur radio DX capability differs with the nature of each allocated frequency band and type of propagation. World-wide contact is possible on a number of High Frequency radio bands allocated to amateurs (short wave bands) during various parts of the day. Hi Larry, thanks for being the first to make a comment about this. A friend of mine, a lawyer, complained about the ‘jargon’. I have worked on this for a while. I hope it will be useful for some. Hello Peter, thanks for the comment. And it was really good to meet you Friday evening (25th March 2016) at Scott Creek Conservation Park. You have put a lot of thought into this page John, well done. 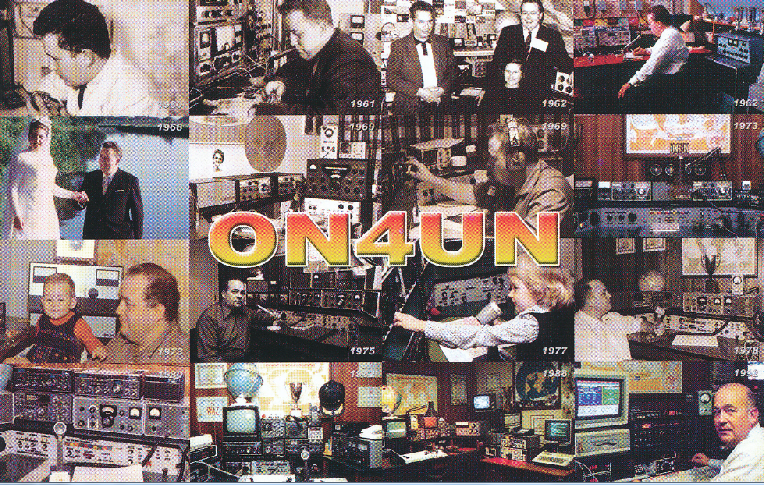 An excellent resource for current and future amateur radio operators. I need to revise the SOTA page with the change in rules relating to accessing the summit and there are a few more jargon words to add as well. Thanks for the positive comment. I did put a lot of work into the page, but all good fun.